The task of choosing “the best help desk” boils down to finding the “right help desk for your company’’. So assessing the candidates, you first have to look for the core functionality. Equally important is to learn how the platform can scale as your business grows. And finally, whether the team will find it comfortable to work with it. In this article, we will compare leader in customer support services and a product from a pioneer in CRM systems - Zendesk vs Salesforce Service Cloud. Zendesk is a software to manage customer issues. You can bring all interactions with customers in one place and build seamless, personal, and efficient support. Service Cloud is a client service solution on the Salesforce Platform. It provides a 360-degree view of your customers' inquiries and enables smart, fast, and personalized communication. Service Cloud offers functionality to automate processes, streamline workflows, and organize self-service materials. Both companies offer monthly subscriptions. 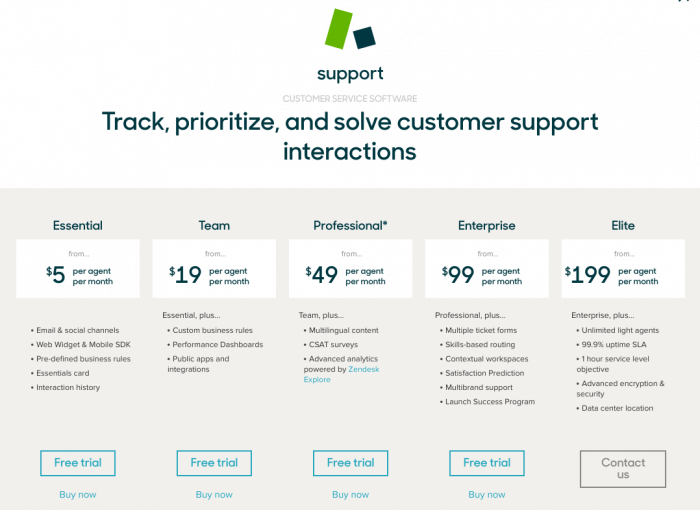 Zendesk has 5 tier pricing. The cheapest plan starts with $5 per agent. The starting price for Service Cloud Lightning is five times higher. The basic set of features for ten agents will cost you $25 per agent. Likewise, the most popular Professional plan in Zendesk costs $49 per agent. Whereas Service Cloud offers its most popular product for $150 per agent. As you can see, the price tag for Service Cloud is significantly higher. Let’s go through their functionality now to find out what you pay for. Let's review Zendesk vs Salesforce Service Cloud features that are the core of help desk software. In Zendesk, you can manage ticket workflow, manually choose and assign tickets to agents. Using automation and triggers, you can automatically assign tickets to specific agents. In Service Cloud, there are no tickets but “cases.” The AI-powered routing allows you to assign cases to the agents that are best qualified to resolve them. A chronological timeline shows the whole customer interaction history providing the necessary context for support engineers. Automating repetitive tasks you can speed up the work of your support team. Comparing Zendesk vs Salesforce Service Cloud, both of them enable agents to provide support across various digital channels. You choose the channels you want to use: email, chat, phone, social networks. And then manage customer requests from one place. With Zendesk guide you can build a smart knowledge base in multiple languages. On Professional and Enterprise plans you get the functionality to create community and branded customer support site. In turn, Service Cloud offers its Lightning Community Builder to create customizable and branded portal or community. full resolution time and others. You can extend Zendesk functionality with over 677 apps from Zendesk marketplace. Service Cloud connects you with other Salesforce products: sales and marketing. So you get full context and the 360-degree view of your customers. Besides, Service Cloud offers unique enterprise level support functionality: 3rd party CTI support, guided scripting, KCS, and others. Service Cloud integrates with over 5,000 apps and extensions available on AppExchange. When we talk about setup, Zendesk beats Service Cloud. You can get it up and running in about a day with core functionality. In turn, to get Service Cloud fully functional, you need to make a lot of customization. Zendesk is a great tool for startups as well as middle size and big companies. It is support-focused, but you can integrate it with CRM systems and other platforms and apps. In turn, Service Cloud users get access to the customers, sales, support, and marketing data in one place. But the price tag is several times higher than that of the Zendesk. And you must be ready to spend time and effort to customize the software according to your needs. If you consider switching to either Zendesk or Salesforce Service Cloud, Help Desk Migration service is here to help. We offer automated and secure migration to transfer your tickets, agents, and knowledge base. Sign up for a free Demo migration to see how it works today! But we're always ready to help migrate data!